From time to time I’ll be posting pictures from book events and my experiences and adventures related to the writing of my stories. In summer 2015, I went on a 4,500 mile book tour to help promote my new book, Ain’t No Harm to Kill the Devil. One of the stops on the trip, shown here, was Alliance, Ohio, where the Haines House Underground Railroad Site is located (which also plays an important part in the book!). 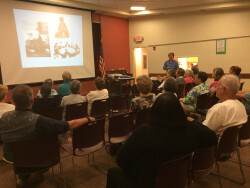 This presentation about the book was for the Alliance Area Preservation Society, a wonderful group of individuals devoted to preserving history. 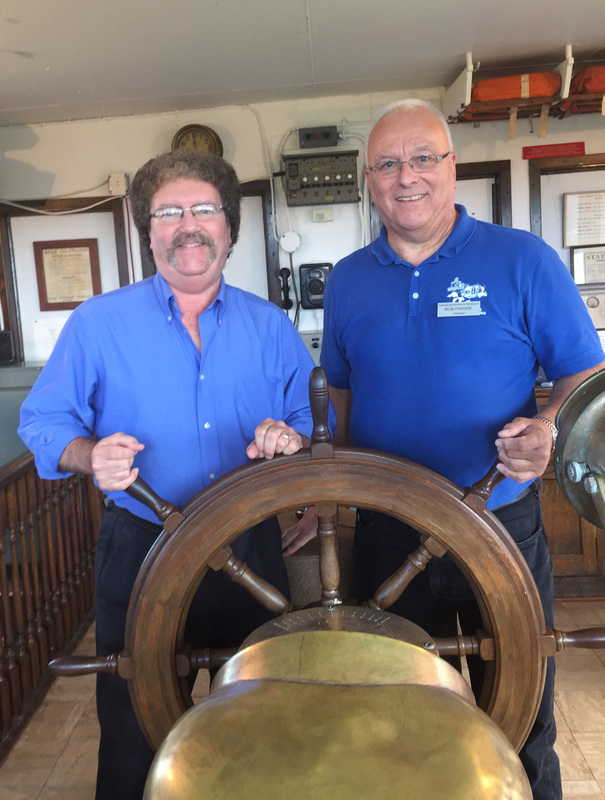 Another stop on the book tour was the Ashtabula (Ohio) Maritime and Surface Transportation Museum, which is just down the street from the Hubbard House Underground Railroad Site (also featured prominently in Ain’t No Harm to Kill the Devil.) 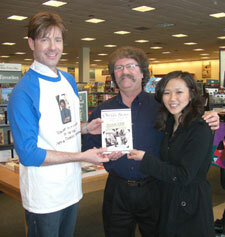 I met up with many old and new friends there while doing a reading from the book. 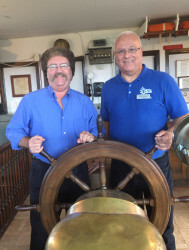 In this picture I’m standing in the “pilot house” section of the museum with the Director, Bob Frisbie, who helped me tremendously with background research for the book. 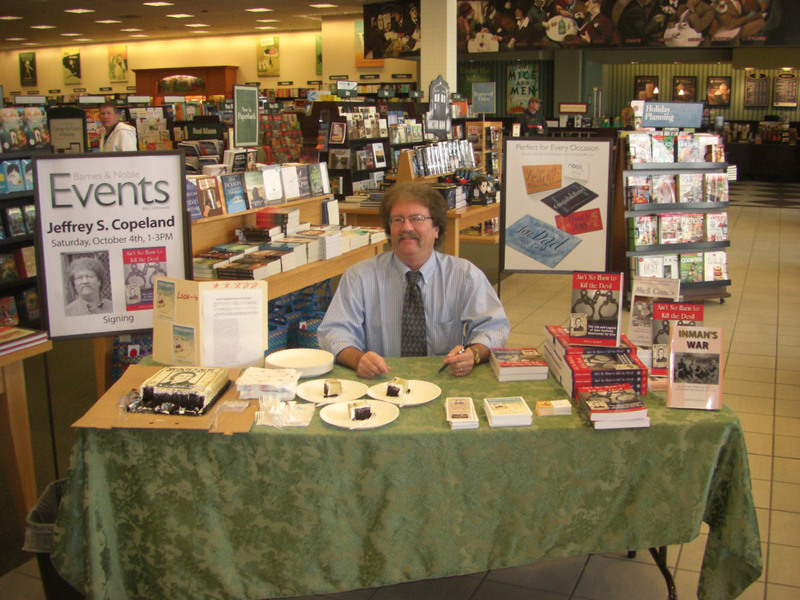 Each year I participate in the “Indies First” event, which is held to promote independent bookstores all across the country. 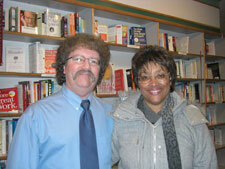 This picture is of me and a new customer in Left Bank Books (St. Louis, MO), one of the finest bookstores ever. 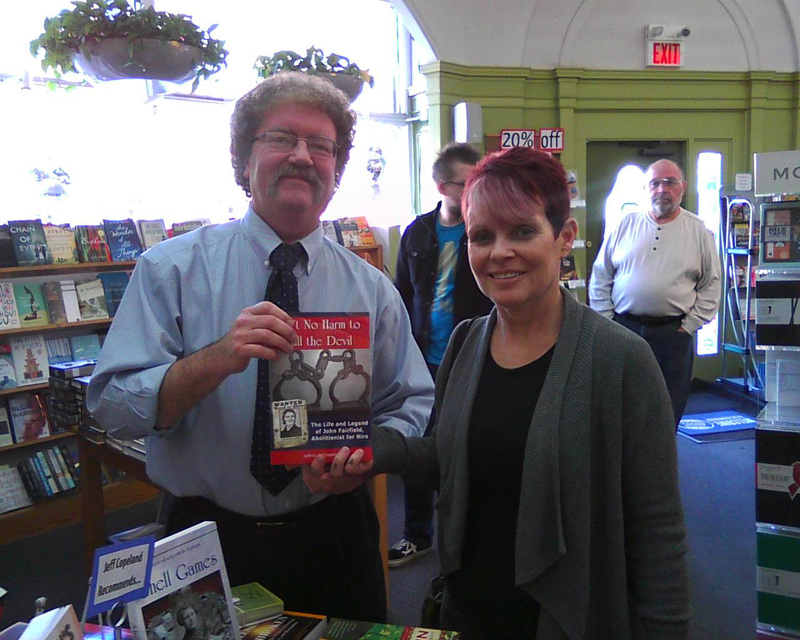 My first book event for Ain’t No Harm to Kill the Devil! Great fun! Book signing for Shell Games. 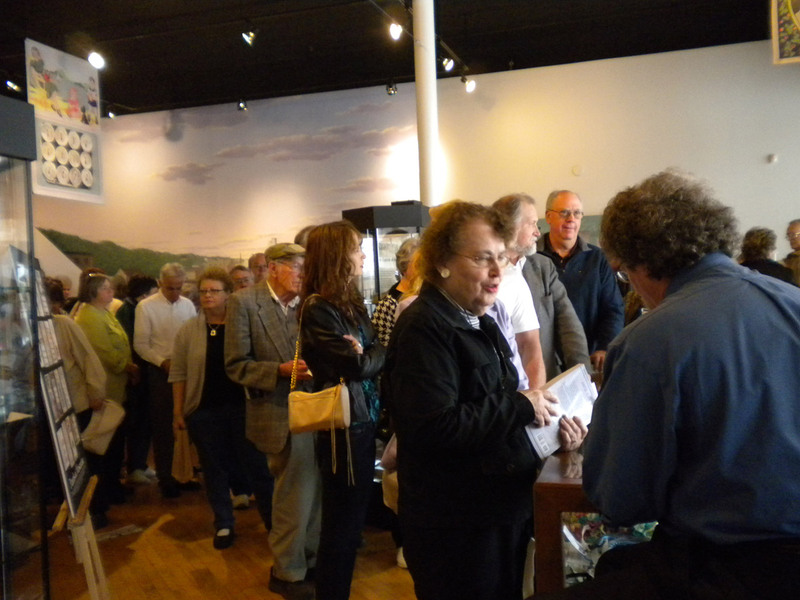 Overflow crowd that day — a bunch of wonderful folks! 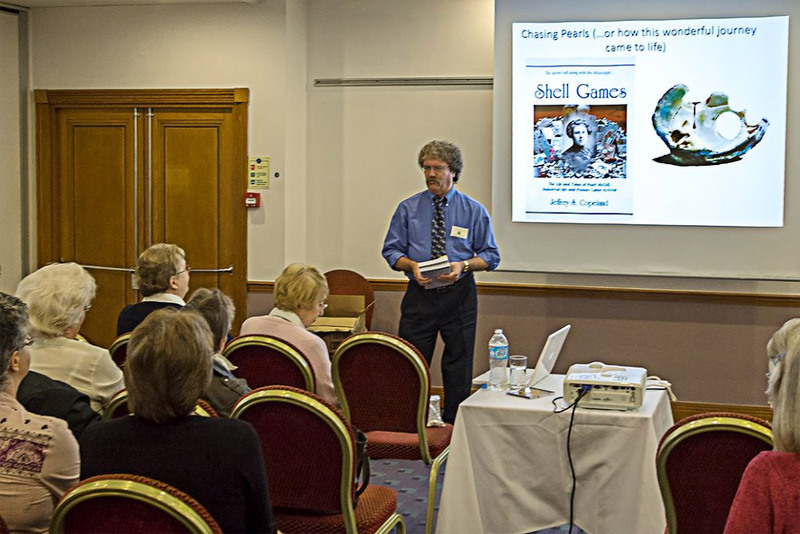 Sharing Shell Games with the “Button Society of Great Britain” in Birmingham, England. A *wonderful* trip with many new friends made across the pond. I love going into the schools to visit with students and teachers. 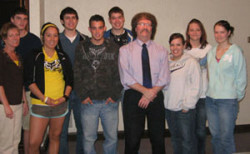 This is Mrs. Erenberger’s class at Prairie High School in Cedar Rapids, Iowa. This is a picture of just part of the class; Mrs. Erenberger is on the far left. I met with the students to talk about the incredible journey I had to make to get the necessary background information for the writing of a nonfiction book. 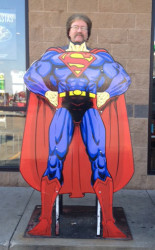 From mild-mannered writer to…I wish! 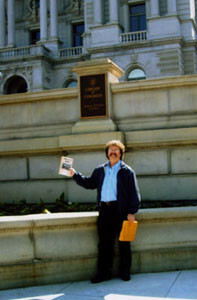 One year I participated in the “Big Read Festival” in St. Louis, Missouri. The people who organized the festival had great transportation set up to get the authors from one place to the next. Unfortunately, I did not get to ride in the Wiener Mobile, but I did get to ride in a limo, and that was cool. I’m still on crutches in the picture. I wrecked my knee while kickboxing and had to be on crutches for a month. Here I am on the Fox television network with anchors Andy Banker and Teresa Woodard. It has become one of my trademarks that I bring cake for people to enjoy while visiting with me at signings and other events. Event at the Fenton/St. Louis Barnes & Noble. The managers there were wonderful! My brother Steve is standing in back on the left. Me with Paula Perkins-Taylor, Olivia and Inmans’ niece, at a Prairie Lights Books event. 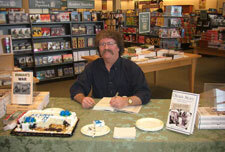 Barnes & Noble event in Waterloo, IA. Note half-eaten cake; one reader ate most of that by himself! Wow! Olivia’s Story event at Prairie Lights Books. 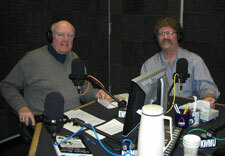 The program was streamed over the Armed Forces Radio Network. I was so proud to be able to do this for those in all branches of our service. 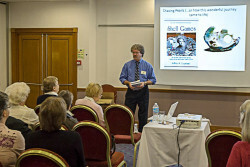 Here I am participating in the “Author Luncheon” at the National Council of Teachers of English conference. I’m with a group of teachers from Mississippi who were getting ready to share Inman’s War with their students. We had a great discussion of the book. I very much enjoyed being with them; they were all wonderful teachers. I very much enjoyed my visit to the Library of Congress in Washington, D.C., where I donated the letters and other materials I used in the writing of Inman’s War. The tour of the “behind the scenes” corridors of the Library of Congress was something I’ll never forget. I’ve never seen so many rare and famous books in all my life! 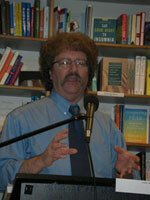 I was able to do several book events in Europe. 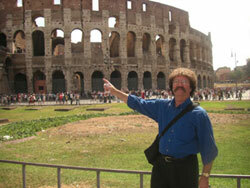 My favorite place to visit while over there was Rome. I also visited a small town called Nettuno, which is about forty miles south of Rome. At Nettuno is the “Sicily-Rome American Cemetery and Memorial.” Over 11,000 Allied soldiers are buried there, including many members of the 449th (from Inman’s War) who did not make it back home. I stood at the grave of one of the soldiers I had written about in Inman’s War and was overcome by emotion. So many sacrificed so much in the name of freedom, and these sacrifices should not be forgotten. Union Station in St. Louis was one of the largest train stations in the U.S. during WWII and has an important place in the telling of Inman’s War. Today the station has been converted to a large indoor shopping mall, but they also have a museum to preserve their rich past as a train station. 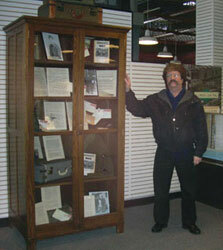 I was honored they chose to create a whole exhibit related to Inman’s War. For the exhibit I donated copies of some of the original letters, Inman Perkins’ actual helmet and military coat, and several other items related to the characters in the story. The next time you are in St. Louis, stop by and see the exhibit in their museum. 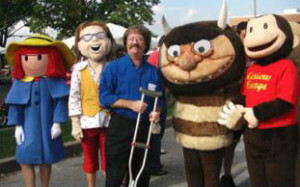 While at the “Big Read Festival” in St. Louis, Missouri, I was able to walk the grounds with some Wild Things and other interesting characters. Notice I’m still on my crutches in the picture. No more kickboxing for me for a long time!